Our friends at ToonStyle tried out a new Marvel Avengers waffle maker — using 100% TJ’s ingredients! They put the Trader Joe’s Buttermilk Pancake & All Purpose Baking Mix to the test, and reviewed the resulting superhero-branded waffles. Check out their Marvel Avengers Waffle Maker Review (including recipe and instructions!) 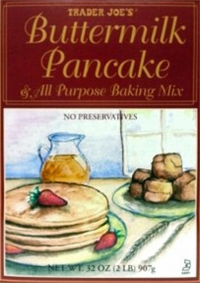 and if you’ve tried the TJ’s baking mix, add your own review here.